On the 1st of November, 1970, RB Mercury Morris, gained a Dolphin record of 302 combined yards. He ran 8 times for 89 yards, received 3 balls for 68 yards and returned 6 kicks for 145 yards. This is not an official site of the Miami Dolphins. Check the Dolphins site in the links page. 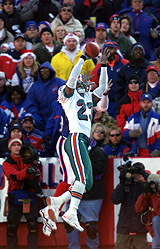 You will find here all the stats and information you will ever need on the Miami Dolphins, stats from every game Dan Marino played in, individual statistics for every single season for any player that ever wore the aqua and orange, game coverage and analysis on upcoming games, and analysis on draft and free agent signees, so Bookmark our site. This site was created by Eran Anchikovsky. No portion of this site may be reproduced without the express written consent of Eran Anchikovsky.